My movie minutes: The Five Fabulous Roles of Sivaji Ganesan. The Five Fabulous Roles of Sivaji Ganesan. 'Give him any role,he will excel'.That was the acting spirit of Sivaji Ganesan,who was born with theatrics in his blood.He was the first Tamil film hero,to don nine roles in a single film and the film Navarathiri was a big hit.Like Oliver Goldsmith the illustrious English writer, who is said to have left not even a single field of literature untouched and whatever he touched he adorned,this great actor, would not have left any role not portrayed and whichever role he did,he did to his best.But there are certain roles which remain extraordinarily brilliant, making them timelessly incomparable.I am giving here five such roles that appear to me immortally magnificent.Of these, three are historical roles and the other two are mythological and spiritual. Fictitious characters are at times easier to play than any historical or mythological roles.This is because, the first type is more open than the latter.The pressures are usually more on an actor who attempts to play important historical or mythological and spiritual characters, that have gone deeper into the socio-cultural roots,as well as into the human psyche of a region. Tamil cinema has periodically visited some of the important historical events relevant to the Indian and Tamil soil with a view to throwing light on life's real time occurrences with verity and value.But all such shows do not yield the intended result on account of either poor narration or actors' lack of involvement in becoming the real life characters.Even Sivaji Ganesan's films like Ambikapathi and Chittor Rani Padmini became failures in bringing history back to life with its inherent layers of interest. But there are three historical characters that Sivaji Ganesan played as a poet,a provincial ruler and a Swadeshi business man, that live as monumental roles purely because of Sivaji Ganesan's indisputable authenticity in role performance.Yes,as the ripe, Telugu Poet Tenaly Raman who was the incarnation of intelligence,Sivaji Ganesan demonstrated his highly committed acting skills with poise and perfection. In fact it was one of the earliest roles of Sivaji Ganesan. 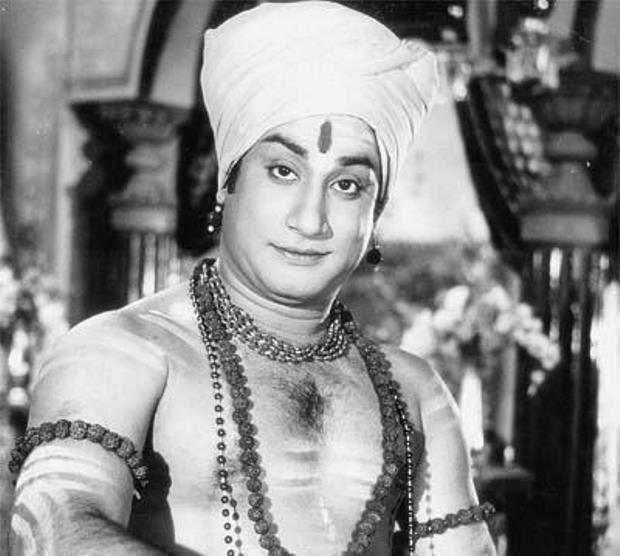 The movie was simultaneously made in Telugu and Tamil, with N.T.Ramarao doing the role of King Krishnadevarayar in both the languages,while Nageshwararao depicting the role of Tenalyraman in Telugu and Sivaji Ganesan in the Tamil version. Being a Telugu remake with quite a few Telugu actors moving through the screen, the film did not reflect Tamil fragrance.But the fact remains that, it was Sivaji Ganesan who brought the film closer to the Tamil audience and made a Telugu poet pass through the linguistic barriers and become part and parcel of the Tamil soil. The film Tenaly Raman might not be said to have become a great hit.But the character Tenaly Raman got closer to the Tamil people, mainly because of the realistic presentation of role by the actor par excellence. Sivaji Ganesan who created dramatic waves by his very first movie Parasakthi, began to rule Tamil cinema not only through his verbal efficacy for lengthy ranting dialogues, but also through his credentials for natural acting. Tenaly Raman was an early sample of this marvelous actor's flair for underplay of characters with effortless humor and instant punch.Today if any one makes a reference to the historical character Tenaly Raman,those who know the days of nascent Tamil Cinema, would instantly fix Ganesan's profile on this historical figure of literary fame. After this film, it was no wonder that this actor whose body and mind were consummately made up of the acting stuff, spontaneously poured forth his entire energy levels for becoming Veera Pandiya Kattabomman,a provincial ruler who fought tooth and nail, against the British Raj and bluntly refused to be enslaved by the invading forces, indulging in a process of taxation and hateful enslavement. This epoch making film produced and directed by the Padmini pictures' B.R.Panthulu, was a Summer release in 1959 and was the first Tamil film to be made in Technicolor. Sivaji Ganesan became the personification of a firebrand rebel, stoutly raising his voice against the alien oppressive rulers,who came to India, in the guise of the East India Company.The story line for this war film was written by M.P.Sivagnanam,a famous Tamil scholar and political representative and the dialogues were written by Sakthi T.K. Krishnasaamy. The force of the dialogues and the way Sivaji Ganesan uttered them made the film a lasting show of historical events on the big screen.Every aspect of the film was invincible and every actor made their role play precisely true to life.It was a block buster film and would ever be one of the most fabulous shows of Sivaji Ganesan. Following the victory of this film B.R.Pantulu was inspired to make another film based on some notable events that took place in Tamil Nadu as a close corollary to the Indian Freedom Movement.This film Kappalottiya Thamizhan which was a Deepavali release of 1961,biographically narrated the life story of V. O. Chidhambaram Pillai,who founded a Swadeshi Stream Navigation company, to lift the image of India in the midst of the aggressive East India Company, which came to India under the auspices of the imperialist forces, to conquer and suppress both the business and freedom of Indians. Sivaji Ganesan lived as V.O.C. Unlike in Veerapandiya Kattabomman there were no ranting dialogues in Kappalottiya Thamizhan.It was a black and white film,for which the story line was provided by the same M.P.Siva gnanam but the dialogues were penned by'Chitra' Krishna swami.Though the film was a moderate show, no one could fault the natural, down to earth performance of Sivaji Ganesan and the equally impressive acting of Gemini Ganesan,Savitri, S.V.Renga Rao,K.Balaji, S.V.Subbiah,T.K. Shanmugam and others. As poet Bharathi and as Subramanyam Siva S.V.Subbiah and T.K.Shanmugam gave a brilliant performance.The narration was so realistic that the scenes showing the last days of V.O.C and Poet Subramanya Bharathi brought tears to the entire audience at the theatres. 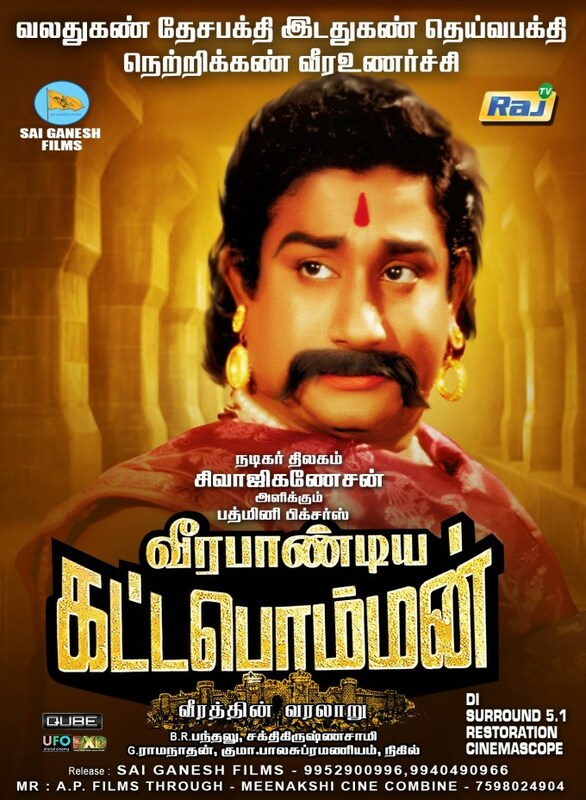 Perhaps the low profile dialogues and the composed acting of the cast, failed to take it to the level of the very lively narration and vigorous action display witnessed in Veerapandiya Kattabomman.Though the film fizzled out at the box office, till date when one thinks of V.O.C it is Sivaji Ganesan with his turban would stand before them bringing to one's focus the aristocratic nobility,the righteousness in approach and the historically recorded commitment of V O C to the Swadeshi movement,as an inspiring force of the Freedom struggle in India. Besides the dazzling shows mentioned above,Sivaji Ganesan performed two other awesome roles,one from Hindu mythology and the other from the life of a divine Hindu saint. Sivaji Ganesan played both the roles with utmost veracity and credibility in looks and portrayal of emotions.The first one was that of the Surya Puthra Karna and the second was the sacred Tamil, Hindu saint Thirunavkkarasar also known as Appar. It was again B.R.Pantulu who made the outstanding mythological film Karnan produced under his Padmini pictures and released in 1964.While A.P.Nagarajan took up the screen play it was Sakthi T. K. Krishnaswami who wrote the dialogues for the film,after Veerapandia Kattabomman.This color film had most of the Kurushetra war scenes shot in outdoor locations in Jaipur.The film had an excellent cast with Sivaji Ganesan as Karnan S.A.Asokan as Dhuriodhana,N.T.Ramarao as Lord Krishna and R.Muthuraman as Arjuna.The female cast included Devika and Savitri as the wives of Karna and Dhuriyodhana respectively and M.V.Rajamma donning the role of Kundhi Devi,the mother of Karna and his half brothers the Panja Paandavas. 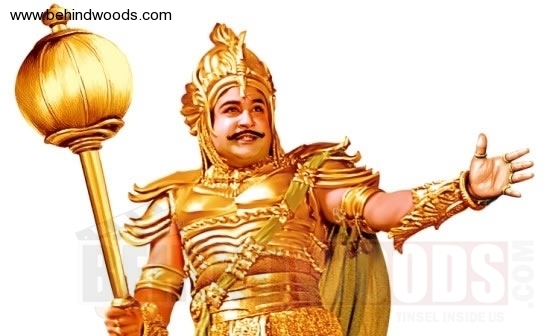 Sivaji Ganesan as the most wronged and harmed Karnan, passionately embraced the character and literally made an outburst of his pent up emotions of anguish and despair,that necessarily formed the base of the characterization of the forlorn hero of the Maha Bharatha. He would roar against the injustice that was serially meted out to him and at the same time melt down the moment he saw his mother who disowned him.Charity,chivalry,and gratitude were the three major virtues that Karna, inhaled as his life breath and he remained as the incarnation of those virtues till his last breath. So perfect was Sivaji Ganesan's portrayal of Karnan in body and spirit, that words go wanting,if one tries to talk about this peerless hero's perfect role absorption of Karna. The fifth in my favored list is that of the character of the Tamil Savaite saint Thirunavukkarasar who was also called Appar. 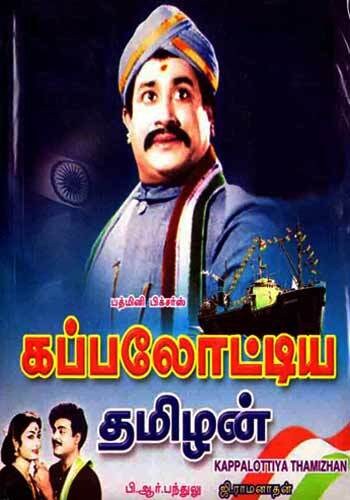 Sivaji Ganesan took up this role for A.P.Nagarajan's spiritually inspiring film Thiruvarutchelvar. It was one of the most difficult roles,even for a highly involved and talented actor like Sivaji Ganesan. Besides the flawless make up manual meant for the saint's aged looks,the excellent way Sivaji Ganesan imbibed and delivered the sacred intricacies and subtleties of the role, carried a venerable demonstration of the saint on the screen. The two songs"Pithaa Piraisoodi Perumaane"and ''Naadharmoodi Melirukkum Nallapaambe"were beautifully pictured to enhance the quality of portrayal, by creating saintly vibrations in celluloid form.In looks, gait and governance of words,Saint Appar was unquestionably reborn on the screen.I doubt if any other hero could have succeeded to this extent, in taking the body and soul of a saint, closer to the audience. This article is born of my life long love and admiration for a Tamil hero, who frequently crossed the conservative,stipulated barriers of acting, to conquer the unconquerable.Though the much deserving Chevalier title was conferred upon him, it was really unfortunate that this high profile actor's grandeur was less recognized in India, in terms of awards and titles.The numberless challenging roles he took up to deliver, are all being listed and remembered only by Tamil film lovers, who are known for evaluating an actor's credentials mostly in terms of their emotional admiration for his/her inspiring and appealing portrayal of roles. While a majority of Sivaji Ganesan's roles were born of creative imagination,the five fabulous characters focused here,were reflective of history, mythology and Hindu spiritual reality.That Sivaji Ganesan made all the five characters revive and reverberate in the larger than life spectrum of cinema and that he left indelible impressions of those five roles,are the undying wonders of Tamil film history. Excellent rendering of the five characters which the late Sivaji Ganesan lived. Hats off to you Sir.Your memory of the makers of the film is phenomenal. I also like Sivaji's characterization as barrister Rajinikanth in the movie " Gauravam". 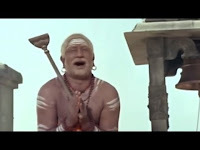 Thanks Mr.Raj for your much valued comments.As the topic is about Sivaji Ganesan's role performance of real life characters I had to restrict my references.In fact besides Gowravam I love that mighty hero's role performance in many other prominent films like Paava Mannippu,Paasamalar,Bhaagap Pirivinai,Aalaya Mani,Aandavan Kattalai,Padithaal Mattum Podhuma,Paalum Pazhamum,Paarthaal Pasitheerum,Pudhiya Paravai,Raman Ethanai Ramanadi,Paar Magale Paar,Dheiva Magan,Uyarndha Manidhan,Rajapart Rengadhurai, Navaraathiri,Vietnaam Veedu,Gnaana Oli and many others including all the films of A.P.Nagarajan.What to do.My space is limited. Well said Sir. In fact, I wanted to include Vietnam Veedu as well but the office atmosphere did not yield to my writing a detailed comment. A Rich 'Mersel' Made Richer by Resistance.